strict warning: Only variables should be passed by reference in /var/www/html/prod-lijed/sites/all/themes/lij/node-visual_stim.tpl.php on line 8. Hypertrophic obstructive cardiomyopathy (HCOM) is a genetic disorder that affects 1:500 adults. It’s a heterogenous genetic condition affecting the proteins of the cardiac sarcomere inherited in autosomal dominant fashion. The majority of patients remain asymptomatic throughout their lives but other develop symptoms secodary to the mechanical effects of the disorder such as dyspnea, exercise intolerance, angina, syncope and ventricular arrythmias leading to sudden cardiac death. The underlying pathology revolves around inappropriate and asymmetrical hypertrophy of the left ventricle (LV) most commonly involvng the septum leading the LV outflow tract obstruction. The degree of obstruction is dynamic and depends on the patient's volume status. A patient that is volume depleted develops an increased outflow gradient whereas volume repletion increases the obstruction. The degree of obstruction does not correlate with risk of sudden cardiac death. Patients also develop impaired LV compliance resulting in diastolic dysfunction but will often have intact systolic function. Many patients with HOCM have no or only minor symptoms. As a result, affected children and adolescents are often diagnosed during family screening. Patients with mild to moderate manifestations usually experience slow progression of symptoms with advancing age in association with a modest deterioration in left ventricular function. Many patients with HCM eventually develop one or more of the following symptoms: dyspnea, chest pain, syncope, palpitations, and fatigue. However, the symptoms of HCM are variable and there is not a tight correlation between the degree of left ventricular (LV) outflow tract obstruction and symptoms. Some patients with severe LV outflow tract obstruction remain asymptomatic for many years, while many patients without obstruction may have significant limitation. In addition, cardiac arrest or sudden cardiac death may be the initial presentation. Sudden cardiac death has the highest incidence in preadolescent and adolescent children and is typically associated with sports or vigorous exertion. The arrhythmia that causes sudden death is ventricular fibrillation in more than 80% of individuals. Dyspnea is the most com.mon presenting symptom and occurs in as many as 90% of symptomatic patients. It occurs secondary to elevated LV filling pressures which is transmitted retrograde to the pulmonary circulation. Syncope is a common symptom of hypertrophic cardiomyopathy. It results from inadequate cardiac output during exertion or from cardiac arrhythmia. A child with HOCM and a syncopal episode is at significant risk of sudden cardiac death and needs aggressive evaluation. Typical symptoms of angina are seen in children with hypertrophic cardiomyopathy and occur in the absence of detectable coronary atherosclerosis. Angina is most likely due to an impaired diastole in a myocardium with a markedly increased oxygen consumption due to ventricular hypertrophy result in subendocardial ischemia, particularly during exertion. Early signs of congestive heart failure, such as orthopnea and paroxysmal nocturnal dyspnea, are observed in individuals with severe cases of hypertrophic cardiomyopathy. Congestive heart failure is present in 10% of children at initial presentation. In terms of EKG findings, it is abnormal in 90% of patients with HOCM, but the majority of ECG finding are non specific and need to be interpretted within the clinical situation (i.e. ag of patient, presenting symptoms, family history). Common abnormalities include include increased QRS complex voltage, QRS complex widening, Q waves, and ST-segment/T-wave changes consistent with ventricular hypertrophy. The most specific EKG finding in teenagers is the appearance of Q waves in leads II, III, aVF, V5 & V6. A study by Shimizu et al suggests that this finding is the earliest electrocardiographic manifestation of certain patients with HCM, preceding both wall hypertrophy and other echocardiographic abnormalities. ST-segment/T-wave changes were found in greater frequency after age 20 years; furthermore, the electrocardiographic LVH pattern increased with age, whereas conduction disturbances were primarily seen after age 40 years. 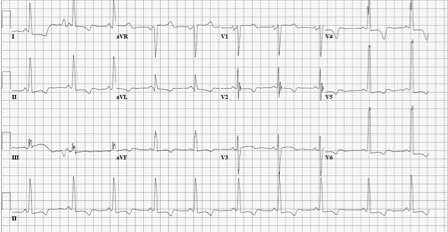 The appearance of these abnormal Q waves in the teens studied had a reported sensitivity of 67%, specificity of 100%, positive predictive value of 100%, and negative predictive value of 78% for the diagnosis of HCM. In the above case, the patient had some subtle signs of early congestive heart failure (b/l lower extremity pitting edema, b/l basilar crackles, elevevated BNP), but was not in decompensated HF (i.e. no tachypnea, 100% o2 sats, clear CXR). Pt was seen by cardiology and a an echo was obtained to confirm the diagnosis, and she was placed on a beta blocker that resulted in a resolution of symptoms. Shimizu M, Ino H, Yamaguchi M, et al. Chronologic electrocardiographic changes in patients with hypertrophic cardiomyopathy associated with cardiac troponin I mutation. Am Heart J 2002; 143(2):289- 93.